At New York Comic Con, during the Star Trek: Discovery panel, Alex Kurtzman said something that I’ve been thinking about a lot. He said that you couldn’t do “City on the Edge of Forever” now, because Kirk would have to spend a whole season mourning Edith Keeler. Instantly, something in me rebelled. “But ‘City on the Edge of Forever’ is perfect the way it is!” I thought. “City of the Edge of Forever” is rightly considered a classic: an episode where an out of his mind McCoy travels back in time and saves a woman’s life. In following him, Kirk falls for the woman, named Edith Keeler, only to discover that if she doesn’t die, all of history is changed for the worse. So, he has to go back in time again and let her die. As a self-contained story, it does everything that it needs to do. There’s a part of me that feels that focusing on the aftermath for any significant period of time would dilute the effectiveness of the episode. And while it would be more realistic for Kirk to spend more time devastated, the point of the episode—sacrifice for the common good—would be lost because it would instead have to focus on a completely different point, namely the effect of trauma on Kirk. We’d be sacrificing one truth for another. For one reason or another, I’ve been thinking a lot about Star Trek lately. Most of the time, the various Star Trek shows told self-contained stories along the lines of “the crew arrives at a planet/meets a new person, and a story unfolds from there.” There were overarching themes or stories, yes, but a lot of the value of those shows was in seeing a crew we knew encounter something we didn’t. You can watch a lot of Star Trek episodes without knowing a ton about the show and still understand what it’s trying to convey. And that’s true even of episodes late into the series’ runs. You can watch the Voyager season six episode “Blink of an Eye,” about the Voyager visiting a planet where time moves quickly and generations try to understand what the new object in their sky is, and you can grasp instantly that it’s a story about how a routine thing in your life can have a profound effect on someone else’s without having to know everything in the history of the show. Meanwhile, I can’t imagine recommending a single episode from the last season of The Walking Dead in the same manner. The X-Files likewise split its time between episodes that dealt with large, overarching plots and “monster of the week” episodes. And while the big mythology episodes were satisfying for fans, you wouldn’t recommend one of those for someone who just wanted to a taste of the show. You’d recommend “Clyde Bruckman’s Final Repose” or “Home,” depending on that person’s tastes. And that’s the other thing lost with the push to serialization: variety. The connective tissue was the characters we knew and loved. The seasons had a lot of tonal shifts but no one really complained that it wasn’t “realistic.” It was all fine because of course Mulder and Scully’s whole lives weren’t just chasing down a conspiracy, or light-hearted romps, or terrifying encounters with monsters. Hell, their lives weren’t even all shown to us. Stuff clearly happened between episodes. A lot of the time, now, episodes flow directly from the end of one to the beginning of the next, creating an effect that’s more like a 13-hour movie, where everything is continuous. Save for sitcoms, it seems like there’s a definite polarization happening in terms of serialization versus episodic television. Along with with seasons of television that are binged, analyzed, and dissected endlessly for clues about where they’re going, there’s also been a rise in anthologies, miniseries, and made-for-TV movies. Both Game of Thrones and Black Mirror have critical, commercial, and zeitgeist-y success with radically different approaches to television. The middle ground, however, has vanished. It’s harder now for a show to have a few perfect episodes—episodes that, on their own, justify the existence of the whole show. Everything is so intertwined that you can’t tease out a single episode that’s fun to watch on its own merits. There are people who still feel the end of Lost poisoned the rest of the show. Maybe if the mythology hadn’t taken over, that could have been prevented. That, more than the stuff about hope or violence or even cursing, is what I’m looking for when I watch Star Trek: Discovery—that perfect episode that was more a morality play performed by characters I loved than the puzzle piece of a grand design. The way Discovery is shaking out—the way all television works now—I have trouble seeing where a standalone episode isn’t an aberration rather than part of the fabric. 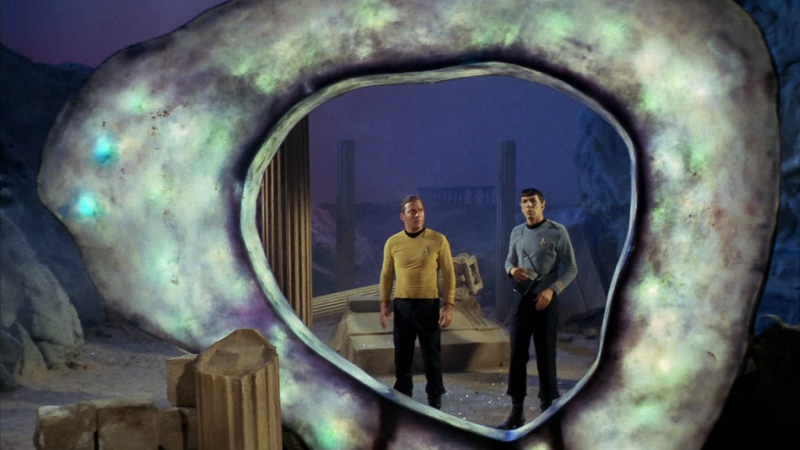 Which makes that show getting its own “City on the Edge of Forever,” or “The Inner Light,” or “Far Beyond the Stars,” or “The Thaw,” or “In a Mirror, Darkly,” to name one for each other Star Trek show. We’re never going to see a crew of people we know stop by a planet with a portal to the past, use it, and then move on to the next thing. That’s not “realistic.” Even if it did reveal a truth.